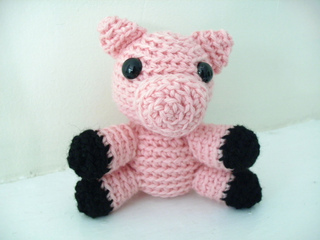 Who wouldn’t fall in love with this adorable little pig? 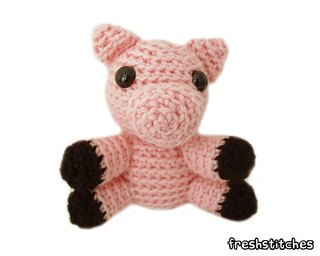 He’s small enough to fit in the palm of your hand, and he’s quick and easy to crochet! Cliveton is 4” tall when completed with worsted weight yarn! And because he’s so tiny, he doesn’t take very long to make… you could have a whole gathering (what are a group of pigs called, anyway?) in an evening! Want a bigger or smaller monster? Cliveton can be crocheted with any weight yarn… instructions for modification included! If you love Cliveton, you might be interested in the Rainbow Amigurumi e-book… it’s got this cutie and 6 other adorable tiny amigurumi! This is an easy level pattern, which means that if you can single crochet, you can do it! Pattern is a pdf that contains step-by-step photographs, so you’ll never get lost. Plus, you can email anytime for help!